Key decisions to stay and go – and what baits to throw – helped longtime Rapala® Pro Terry Bolton win his first FLW Tour tournament Monday on Sam Rayburn Reservoir in Texas. The first decision? To stay on tour another year. The second? To go with Rapala DT crankbaits throughout the four-day contest. Bolton caught most of the fish he weighed on Rapala® DT®-10, DT®-14 and DT®-16 crankbaits in Caribbean Shad and Demon color patterns. He threw them on 12- and 14-pound prototype Sufix Advance fluorocarbon line. “DT” stands for “Dives To.” DT-series crankbaits dive fast to pre-set depths and stay in the strike zone longer than any other lookalike crankbait. A DT-14, for example, dives to and swims at 14 feet. Built of balsa wood, Rapala’s signature material, DT’s combine carefully placed internal weights, a tapered fuselage and a thin tail to create a unique crankbait action. That action on Rayburn helped Bolton catch four 5-bass limits for a total combined weight of 91 pounds, 3 ounces – just 12 ounces more than the runner-up finisher. That total included a whopping 33-pound, 9-ounce, 5-bass limit on day 2. Bolton spent his mornings on Rayburn targeting “a handful” of bare spots near inside grass lines, where he said largemouth were eating shad. “I started out with a … Demon-colored 14 and then I’d switch up to a 10,” he said on the weigh-in stage. “You had to get above them just a little bit.” Later in the day, he told FLW media, he threw a DT-16 on outside grass line drains in 15 to 18 feet of water. Whether you prefer raking shallow shorelines or scouring off-shore spots, off-color water is often key to cranking success. In stained to muddy water, red, orange and chartreuse DT cranks generally out-produce brownish and greenish patterns. Decisions to stay put on one day and to go elsewhere on another, proved fortunate for Bolton – despite some initial consternation about the former. On the day he caught the five bass weighing a combined 33-pounds, 9 ounces, he considered leaving his hot spot after catching the first 27 to 28 pounds. Instead, he stayed put. Soon thereafter, he caught a 9-pound, 8-ounce largemouth. A last-hour decision on day 4 to leave a hot spot also added key ounces to Bolton’s winning total weight. In that spot, he caught three bass bigger than three in his livewell, allowing him to cull the smaller ones and replace them with the bigger ones. 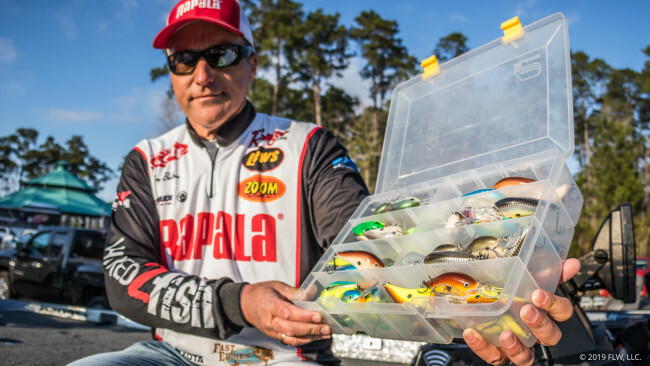 Sam Rayburn is a great lake, Bolton said – and a great one to fish with Rapala DT’s. In 24 years on the FLW Tour, Bolton has earned more than $1.2 million in prize money, won both an FLW Series and BFL tournament, finished in the top 10 in 47 tournaments and competed 13 times in the Forest Wood Cup, FLW’s tour championship. In winning his first-ever FLW Tour tournament Monday on Rayburn, he bested 170 other anglers. “It was my turn, and it just worked out,” he said. This entry was posted in Pro Staff, Rapala. Bookmark the permalink.